Food Network’s sweet series Halloween Wars returns in October for a new season, this year with the creator Child’s Play as one of the judges, as well as a current Scream queen, the Mistress of the Dark, and the great Sid Haig himself dropping in for a bite. Halloween Wars is back for a spooky sixth season filled with chilling new challenges, premiering on Sunday, October 2nd at 9pm ET/PT. Six teams composed of a pumpkin carving expert, cake artist and sugar artist will battle it out as they create Halloween-themed edible displays that are so ghostly good, it’s frightening! In each episode, teams will face two grueling challenges. First, they’ll face off in the Small Scare, where they must create a Halloween-themed design in just 45 minutes. One winning team gets an advantage in the big battle – the Spine Chiller. In the end, their creations will be judged by renowned cake decorator Shinmin Li and writer/director of the iconic Halloween horror film Child’s Play, Don Mancini, and a rotating panel of celebrity guest judges who are legends in the horror genre, including Elvira, Mistress of the Dark¸ Sid Haig (Halloween), Greg Plotkin (Director ofParanormal Activity: The Ghost Dimension), Bitsie Tulloch(Grimm), and Carlson Young (Scream). One team will be eliminated after each episode. In the end, only one team will be declared Halloween Wars Champion by host Jonathan Bennett, and walk away with a $50,000 grand prize. Premiering Sunday, October 2nd at 9pm ET/PT – SEASON PREMIERE! Halloween Wars returns, as six teams made up of an expert pumpkin carver, cake decorator, and sugar artist go to battle to create mind-blowing Halloween-themed displays, in hopes of winning the coveted title of Halloween Warschampion and a $50,000 grand prize. For the first challenge, the six go to battle to create displays that capture an epic and terrifying clash between witches and warlocks. In the end, one team will be eliminated. Special guest judge, Elvira, Mistress of the Dark joins host Jonathan Bennett and judges Shinmin Li and Don Mancini. The five remaining teams made up of an expert pumpkin carver, cake decorator, and sugar artist compete to create mind-blowing and delicious Halloween-themed displays of the scariest haunted roadside motel ever seen. Judges Shinmin Li, Don Mancini and special guest judge, actor and horror icon Sid Haig from Rob Zombie’s House of 1,000 Corpses and Halloween, will help determine which team will be eliminated. 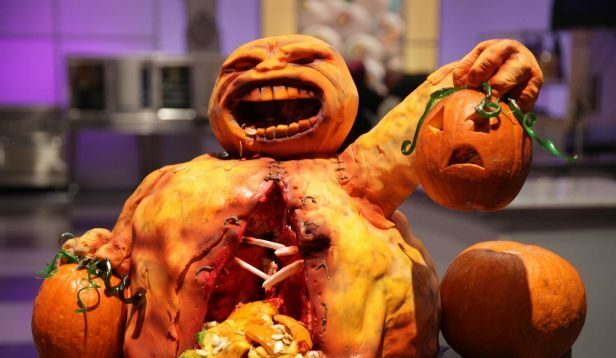 Four remaining teams made up of an expert pumpkin carver, cake decorator, and sugar artist go to battle to create mind-blowing Halloween-themed displays that capture the horror of a two-faced monster. Special guest judge actress Carlson Young from the television series Scream will help judges Shinmin Li and Don Mancini determine the teams that advance. The final three teams of expert pumpkin carvers, cake decorators, and sugar artists go to battle to create mind-blowing displays that capture the horror that unfolds inside of a crypt after dark. Three teams start this battle, but only two will earn their way into the Halloween Wars finale. The decision is made by judges Shinmin Li, Don Mancini and special guest judge Greg Plotkin the director of Paranormal Activity: The Ghost Dimension. Premiering Sunday, October 30th at 9pm ET/PT – SEASON FINALE! It’s the horrifying finale of Halloween Wars. The final two teams made up of a pumpkin carving expert, cake artist, and sugar artist go head-to-head one last time. Only the team that can best capture the scariest and most demonic wedding ever imagined will be crowned Halloween Wars champion, and win $50,000. Special guest judge actress Bitsie Tulloch from Grimm will join judges Shinmin Li and Don Mancini to determine who wins. See what else is on TV for Halloween 2016 here! Sid Haig (left) guest stars on ‘Halloween Wars’ Season 6.